How to Keep your SR22 Insurance Rates Low? Before one can learn how to keep their SR22 insurance rates low, it is important to understand what SR22 is. SR22 is a document drawn up by your insurance company as prove of financial responsibility in case of an accident or incident. It is easy to confuse it with insurance because it is drawn by your insurance company, however, as mentioned; it is not a policy rather a document that states who you are and your financial responsibility. Different states have different rates of minimum cover that each person is required to have when operating a motor vehicle. However, your driving record may cause the authorities to require you to acquire a SR22. Generally SR22 requirements are imposed on people who tend to be risky drivers on the road. While SR22 is not insurance, owning one causes your insurance rates to go up drastically. What drives this situation is the fact that being required to acquire one is prove that you are not a responsible driver. 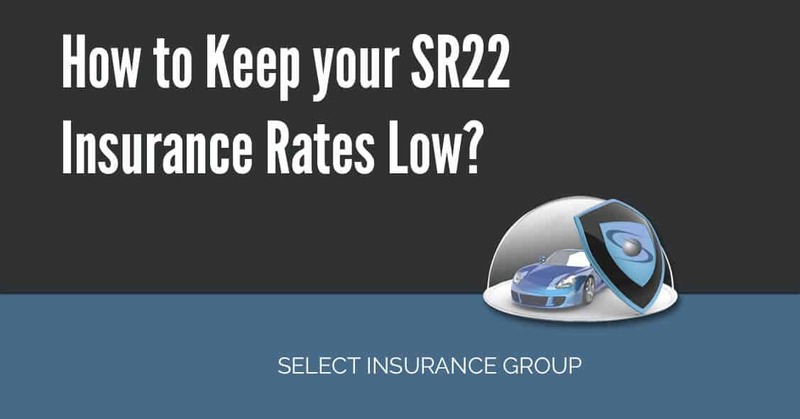 A SR22 requirement forces your insurance company to review your insurance premiums upwards. This is because when you are a high risk driver it means you may be involved in an accident/incident any time. Insurance companies are going concerns; this means they are watchful not to close shop as they settle insurance claims. Therefore, if you are high risk driver, your rates will go up. Note: Sometimes when you do not have a car, you may be required to maintain a SR22 requirement. This is referred to as non-owner SR22. Also important to note is the fact that some states do not have SR22 requirement. Namely: Delaware, Kentucky, Minnesota, Carolina, Pennsylvania, New York, Oklahoma and New Mexico. If you are in a state that has SR22 how do you keep your SR22 requirements at a minimum? In very few words, keep your driving record with little offenses. As a general rule, if you have been required to acquire a SR22, it means your driving license has been suspended. In order to lift the suspension or reinstate, then you must have a SR22. If you are in the habit of getting traffic tickets, have been in a crash that killed someone or have the Tendency to DUI, then your record is bad. Therefore, chances are high that you will be required to provide a SR22 by the courts or the Department of Motor vehicles in your state. Older cars have cheaper insurance costs as opposed to newer cars. This is because of the value of the vehicle. If you were involved in an auto crash in an expensive car, the cost of repairs or replacement (should it be written off) would be much higher. If follows then that new vehicles or high luxury vehicles attract higher insurance. Add to that a Sr22 requirement and the premiums automatically shoot. If you restrict your vehicle to basic travel needs, then your insurance rates will not be as high as for a person who wants to use their vehicle for heavy duty travel. This is because there is more wear and tear for a vehicle that is in heavy use as opposed to a vehicle that is not heavily used. This is because a vehicle that is in tip top condition is less likely to be involved in accidents as opposed to one that is not in very good condition. Also long distance travel exposes you to vast area of open roads. This leads to an increase in speeding in such areas, increases the chances of an accident. Insurance liability is generally different in different states. If you are in a state where the minimum requirement is high, automatically your Sr22 requirement will be higher than for your peers in other states. While you cannot control the law as to what should be the minimum insurance requirement in each state, you can keep your SR22 at a minimum by considering the stated issues above. It is easy to decipher the considerations stated above; however bad driving history needs more clarification to understand what will make you a bad driver in any state. Consider the following situations and decide where you fall and make changes in order to reduce your SR22 in the future. DUI/DW is defined as driving under the influence or driving while intoxicated. This essentially means getting behind the wheel after having a drink, and having alcohol or intoxication in your blood that is above the accepted limits within your state. Studies have shown that a rising number of fatal crashes are caused by drivers who were drunk or intoxicated by a drug (legal or illegal). When you are intoxicated your mental and physical capabilities are inhibited. Meaning you have slower response time, and difficulty in judgment. Because your senses are impaired, you may speed, not realizing that you have really floored your gas pedal or may actually find it fun. Alcohol causes you to disregard the law and your fear is uninhibited. Little wonder then that drunken driving is responsible for a lot of fatal crushes within the country. The same thing can be said of drugs and other intoxicants. Apart from getting your license suspended, many states across the country will send you to jail, fine you require for you to get an IID (Ignition Interlock Device) and probably ask you to attend an alcohol education program within your state. This matter should not be taken lightly as fines have been known to reach such high figures as $10,000 and jail sentences up to 15 years behind bars. The next time you go drinking, ensure your BAC (Blood Alcohol Concentration) levels are well within the limits permitted in your state. Otherwise you will get a SR22 just to reinstate your suspended license. As stated, if you are going to be allowed to maintain a car, the law requires you to have insurance. It makes a lot of sense then why driving without insurance is heavily frowned upon. First off, you are breaking the law. Secondly, in case of an accident how will you meet the costs that will be incurred for compensation? While getting insurance may seem like the natural thing to do, not everyone is keep to do so. If you are caught driving without insurance, you can be sure your driving privileges will be suspended and you will definitely be required to acquire a SR22. Driving without insurance is a grave offense across the nation and the consequences are dire. You need to know street racing is illegal. This is simply because it is very risky. You may damage property and cause injuries of epic proportions. The fact that it also involves illegal betting makes it worse. If you are a fan of street racing however, be warned that once you are caught your license will be suspended, you may face imprisonment and you will pay hefty fines. In case of an accident while street racing the stakes are higher. You will pay more and spend more time in jail. Speed lovers are not very popular with insurance companies. This is because they are insuring a person whom they are sure is not afraid of taking risks. The entire industry is based on risk assessment. The more risky a person, the higher the insurance costs. Once you get an SR22 requirement, you qualify for extremely high premiums. Sometimes these premiums can go up to 200%-400% of the original cost of your original insurance premium. If you have had your insurance suspended, it is best to have someone else do the service for you. When your license has been suspended, it means you are not considered a fit driver. Until the suspension can be lifted, it is advisable to let things be as they are. Driving with a suspended license has bad consequences for you. First, the suspension is re-enforced with more time added to it. Second you are required to get a SR22 or time is increased on an already existing SR22. Vehicular manslaughter occurs when a person loses their life in the event of an accident. If you are the cause of the accident a lot is taken into consideration. For stance, if you were DUI, if you were speeding, if you have insurance and if you have a driving license. Many states treat vehicular manslaughter from a criminal point of view. Conviction of manslaughter is never good for you. Depending on the state you are in, you can spend as many as 30 years behind bars and pays fines as high as $10,000. What is obvious is, you will lose your driving privileges, may require a Sr22 and an IID. Sr22 requirements are sort of automatic when it comes to vehicular manslaughter (whether you were at fault or not). Therefore take extra caution when on the road. Watch out for other drivers too as anything can happen and you will end up with high insurance premiums to pay. Besides, causing someone’s death is not good on any level for whatever the reason. The next time you are stopped by a traffic officer, you may need to negotiate your way out of a ticket rather than just accepting it. This is because the more tickets or points you garner, the worse your record gets. The worse the record gets, the higher your chances for a SR22 requirement gets. Eventually the points or tickets may be used against you in a court of law. Your license may be suspended and in effect you will require a SR22 to reinstate. Besides, the court may at its discretion decide to slap you with the requirement even without suspending your license. It will all depend on your circumstances, the incident in question and the tickets you have gathered with time. Therefore, watch out for those tickets and keep them at a low. Different states have different laws in regard to what is permissible or not when it comes to speed. You must watch out for speed limits in the state you are driving within. Going above certain speed limits in certain areas will lead to a license suspension. For instance in some states, you are not allowed to drive above a certain speed limit in a school area. If you violate this law, you will be heavily penalized, lose your driving privileges and have to acquire yourself a SR22. Some rules are specifically designed to protect children in particular. If for instance you break the child safety rules by not securing your child well in the car or by having a child in the car as you DUI, you are in for a terrible time with the law. The law is very strict when it comes to child protection, and that is why you may find yourself in trouble even for passing school buses in designated areas. It may be an innocent act, but the repercussions are grave for you and your bank account. To this end, ensure you understand traffic regulations in regard to children lest you suffer. Depending on the state, violation of these laws many require you to get a SR22. As explained, once you have this requirement, you have to pay more for your insurance. Hit and run doesn’t always amount to hitting a person and speeding off on the spot. It has a wider definition. If you are involved in an accident (be it your fault or not) and for whatever reason choose to leave the scene of the accident before law enforcement arrives, you are guilty of a hit and run. Unless you are actually critically injured and have been removed from the scene, you are considered as a runaway driver. You do not want this in your records. If you are in a position to help the victims, stay and help. The person at fault is of no consequence. What is important is saving lives. This gesture helps in the future with your insurance premiums. If however you walk away, it will affect you negatively. SR22 requirements are not death sentences. Neither are they hard to acquire. As a general rule your insurance provider should be in a position to draw up one for you. We at Select Insurance Group specialize in this type of insurance. That is high risk insurance. We understand you may have had a lapse of judgment and an accident happens. We will not walk away, we are here to advise and provide the SR22 requirement for you. Our many years in the area of high risk insurance have effectively put us at the top of the field. Do not go to others who have little experience, because you will spend more money. If your insurance provider has dropped you because they deem you unfit to insure, talk to us. Simply fill in the form provided for you. It is easy to fill and gets to us with a click of the button. Apart from SR22 we offer other services like SR22, FR44, SR50, and SR22A. If you have been caught up in a bad situation, we are the people to solve it for you. Our rates too are pocket friendly and our services are top notch. While everyone may condemn you, we embrace you. Talk to us. The only real way to keep insurance rates at a low is to take caution. I love ur blog so much! we think I will visit ur weblog again.